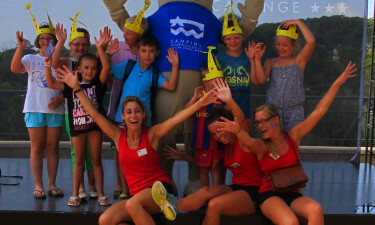 Situated in a beautiful terraced park overlooking the idyllic Platja d'Aro beach and the crystal clear waters of the Mediterranean, the luxury camping site offers an unforgettable holiday experience for the whole family. Leave those grey skies and pressures of work behind for a while and come and enjoy a different rhythm of life under the sun! 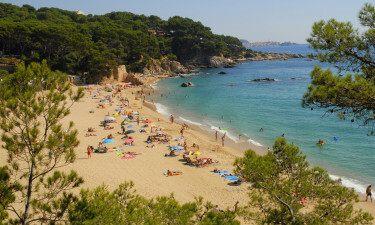 The magnificent coastline of the Costa Brava boasts some of Spain’s finest beaches. 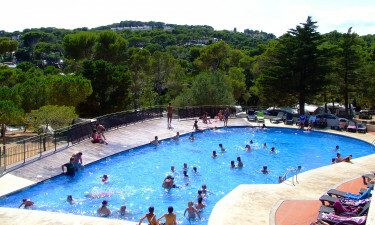 Unwind on the soft sand with a cold drink and soak up the glorious sunshine, take advantage of one of the many exciting aquatic or sporting activities on offer or explore the beauty of the surrounding Catalan countryside. Barcelona, the culturally rich and vibrant capital of the region, is just over an hour away, making it an ideal destination for a day trip. Why stay at Camping Internacional de Calonge? The jewel in the crown, this beach holds the prestigious Blue Flag Award for the quality of its water and excellence of services available to visitors. Aquatic activities such as swimming, kayaking and surfing can all be enjoyed for most of the year. Alternatively, just stretch out and relax under a cloudless sky and bathe in the warmth of the sun. Modern mobile homes provide the perfect combination of comfort with the proximity to nature that only a camping holiday can offer. Luxury camping requires no pitching of tents, just move in, unpack and head for the beach! Rules regarding noise at night ensure you and your family will sleep soundly. Bicycle tours provide the perfect opportunity to explore the picturesque coastline of the Costa Brava and the surrounding countryside. For those who prefer to go by foot, there are numerous hiking trails offering stunning vistas of the coast. Volleyball, football, tennis and golf are available on-site, whilst fishing trips and horseback riding are just 2 of many possibilities available off-site. For toddlers and younger visitors, there is a paddling pool, a well-equipped adventure playground and the hugely popular bright red tractor train. 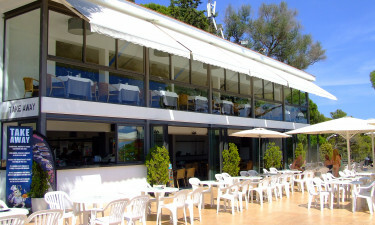 Restaurant and Bar The Restaurant Blauverd serves a mouth-watering selection of authentic Catalan dishes as well as international cuisine, whilst a snack bar offers breakfast daily. Takeaway can be ordered from both the restaurant and bar, which also serves beverages and a selection of regional wines. Sip on a favourite cocktail whilst lazing beside the pool or enjoy a romantic evening for two with drinks under the stars.The Commercial Zone The luxury camping site has a well-stocked supermarket offering a wide variety of national and international goods and produce, including fresh fruit and vegetables, plus an extensive selection of wines and spirits. There is also a large bakery for freshly baked bread. Newspapers, magazines and books, along with souvenirs and other gift items are also available for purchase. The supermarket and bakery are open from early April to late October.